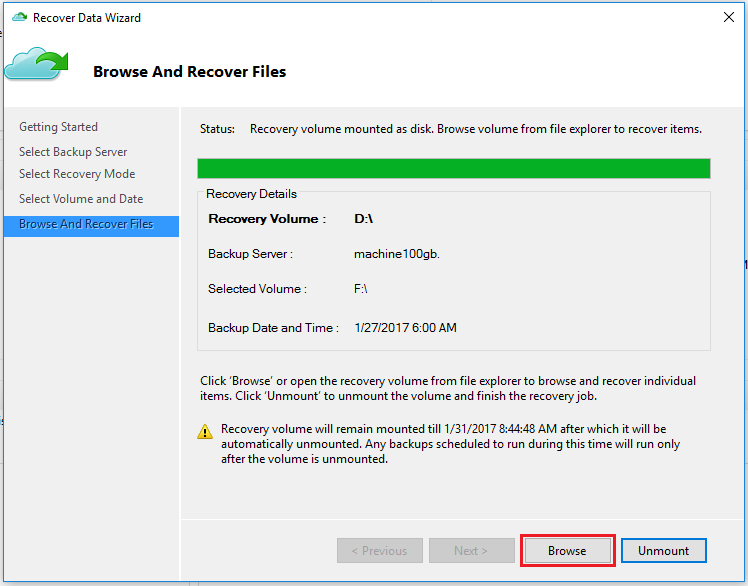 将数据还原到备份时所在的同一台计算机。Restore data to the same machine from which the backups were taken. 将数据还原到备用计算机。Restore data to an alternate machine. 使用“即时还原”功能可将可写入的恢复点快照作为恢复卷装载。Use the Instant Restore feature to mount a writeable recovery point snapshot as a recovery volume. 然后，可以浏览恢复卷，并将文件复制到本地计算机，从而选择性地还原文件。You can then explore the recovery volume and copy files to a local computer, thereby selectively restoring files. 如果想要使用“即时还原”来还原数据，请安装 Azure 备份更新（2017 年 1 月）。The January 2017 Azure Backup update is required if you want to use Instant Restore to restore data. 此外，必须在支持文章所列的区域中的保管库内保护备份数据。Also, the backup data must be protected in vaults in locales listed in the support article. 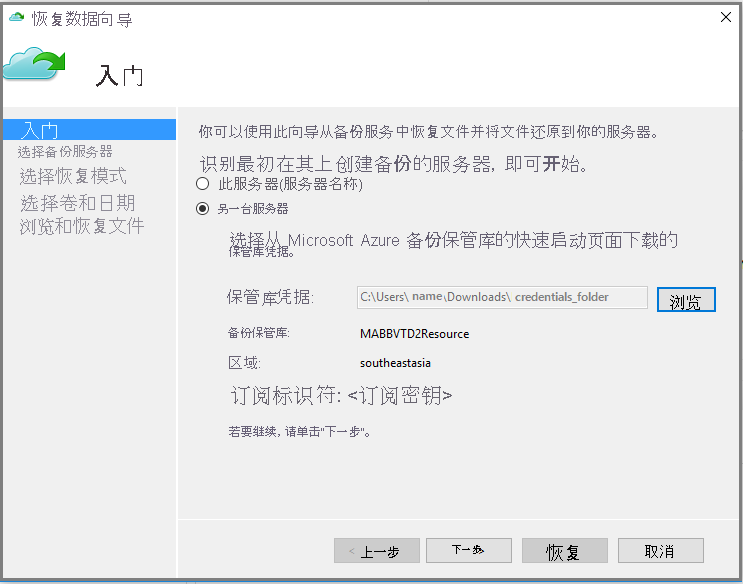 请查阅 Azure 备份更新（2017 年 1 月）以获取支持“即时还原”的区域的最新列表。Consult the January 2017 Azure Backup update for the latest list of locales that support Instant Restore. 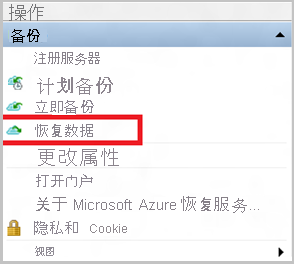 在 Azure 门户中将“即时还原”与恢复服务保管库配合使用。Use Instant Restore with Recovery Services vaults in the Azure portal. 如果在备份保管库中存储了数据，则这些保管库已转换为恢复服务保管库。If you stored data in Backup vaults, they have been converted to Recovery Services vaults. 如果要使用即时还原，请下载 MARS 更新，并按照提及即时还原的过程进行操作。If you want to use Instant Restore, download the MARS update, and follow the procedures that mention Instant Restore. Azure 具有用于创建和处理资源的两个不同的部署模型：Resource Manager 和经典。Azure has two different deployment models for creating and working with resources: Resource Manager and classic. 本文介绍如何使用 Resource Manager 部署模型。Microsoft 建议对新部署使用该模型，而不是经典部署模型。This article covers using the Resource Manager deployment model, which Microsoft recommends for new deployments instead of the classic deployment model. 如果意外删除了某个文件并想要在同一台计算机（备份位置）中还原文件，以下步骤可帮助你恢复数据。If you accidentally deleted a file and want to restore it to the same machine (from which the backup is taken), the following steps will help you recover the data. 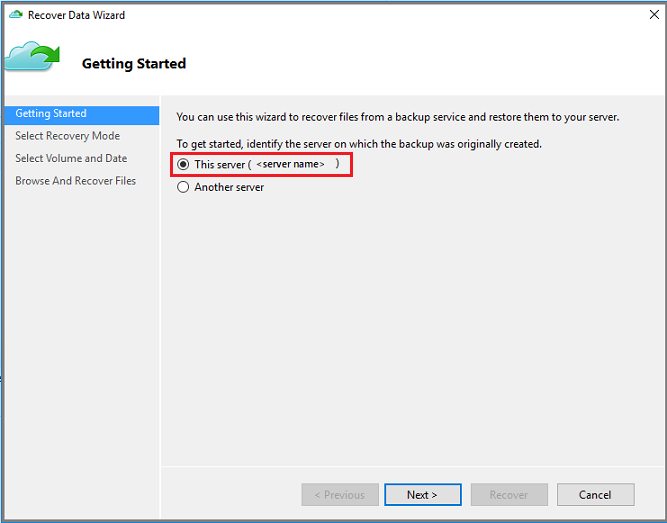 打开“Microsoft Azure 备份”管理单元。Open the Microsoft Azure Backup snap-in. 如果不知道管理单元的安装位置，请在计算机或服务器中搜索“Microsoft Azure 备份”。If you don't know where the snap-in was installed, search the computer or server for Microsoft Azure Backup. 该桌面应用应该会显示在搜索结果中。The desktop app should appear in the search results. 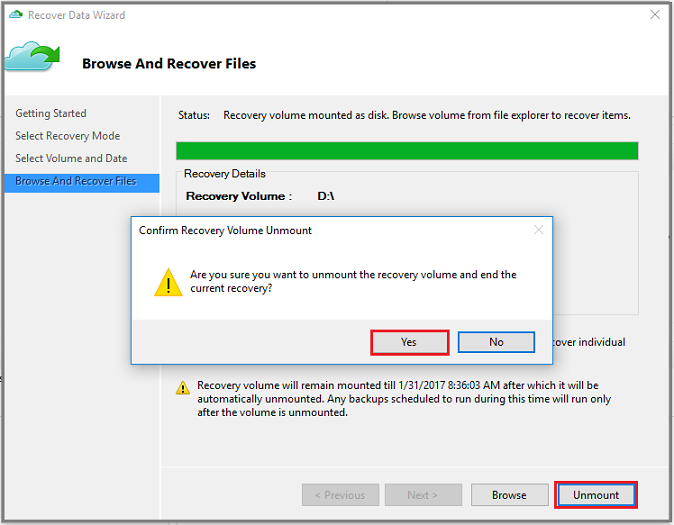 选择“恢复数据”以启动向导。Select Recover Data to start the wizard. 若要将数据还原到同一台服务器或计算机，请在“开始”页上选择“此服务器(<server name>)” > “下一步”。On the Getting Started page, to restore the data to the same server or computer, select This server (<server name>) > Next. 上选择恢复模式页上，选择单个文件和文件夹 > 下一步。On the Select Recovery Mode page, choose Individual files and folders > Next. 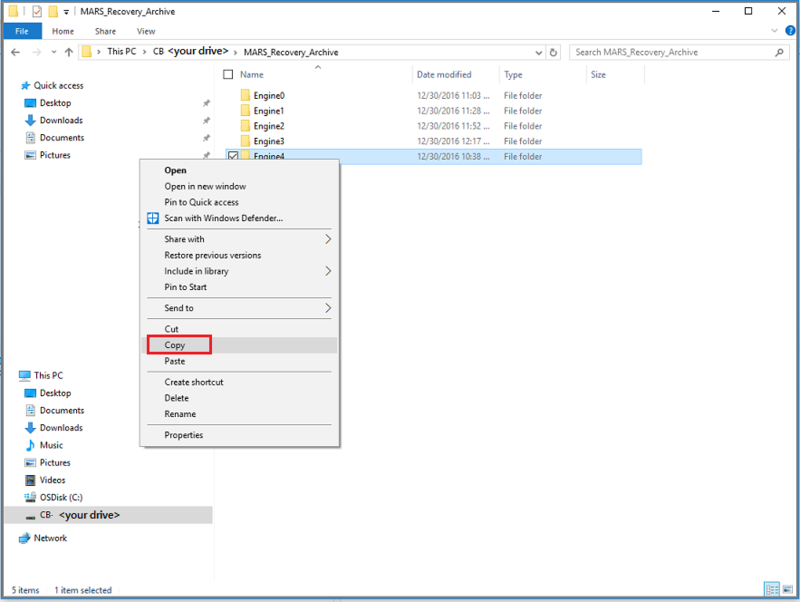 还原单个文件和文件夹的选项需要 .NET Framework 4.5.2 或更高版本。The option to restore individual files and folders requires .NET Framework 4.5.2 or later. 如果未看到“单个文件和文件夹”选项，则必须将 .NET Framework 升级到 4.5.2 或更高版本，然后重试。If you do not see the Individual files and folders option, you must upgrade .NET Framework to version 4.5.2 or later, and try again. 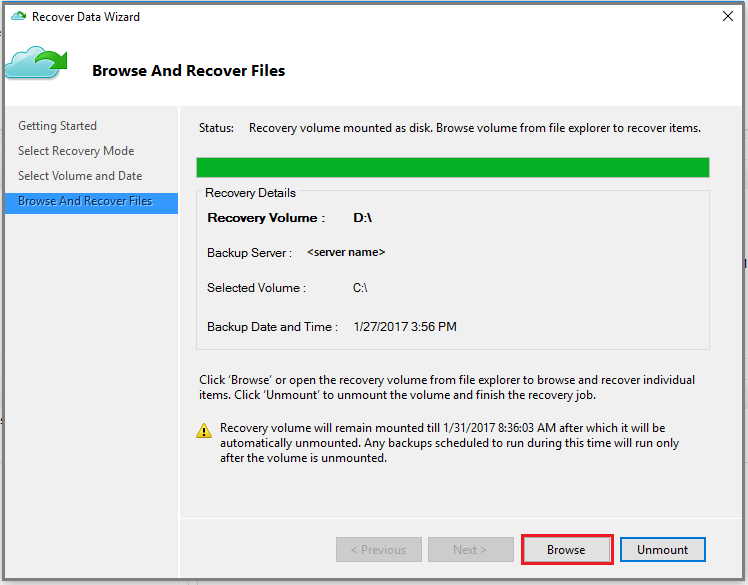 使用“单个文件和文件夹”选项可以快速访问恢复点数据。The Individual files and folders option allows for quick access to the recovery point data. 它适用于恢复各个单独的文件，各个文件的总大小不能超过 80 GB，在恢复期间，它的传输或复制速度最高可达 6 MBps。It is suitable for recovering individual files, with sizes totalling not more than 80 GB, and offers transfer or copy speeds up to 6 MBps during recovery. 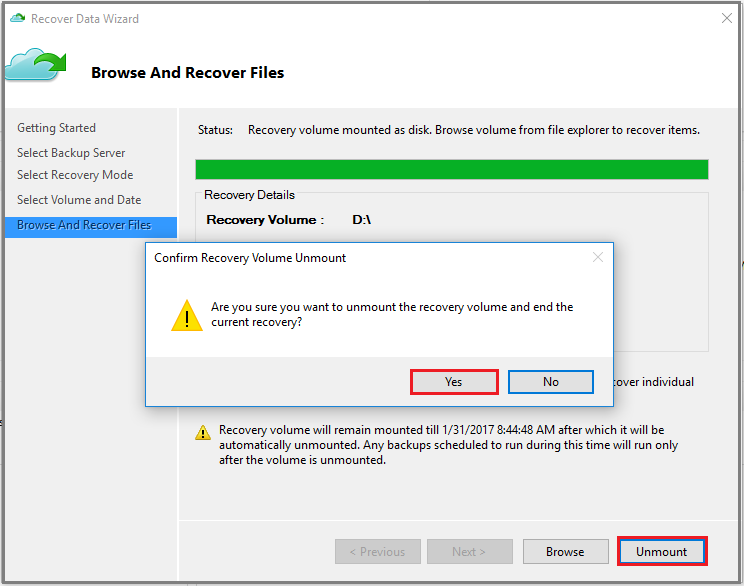 “卷”选项恢复指定卷中的所有备份数据。The Volume option recovers all backed up data in a specified volume. 此选项可提供更快的传输速度（高达 60 MBps），这适用于恢复大量数据或整个卷。This option provides faster transfer speeds (up to 60 MBps), which is ideal for recovering large-sized data or entire volumes. 在“选择卷和日期”页上，选择包含想要还原的文件和文件夹的卷。On the Select Volume and Date page, select the volume that contains the files and folders you want to restore. 在日历中选择一个恢复点。On the calendar, select a recovery point. 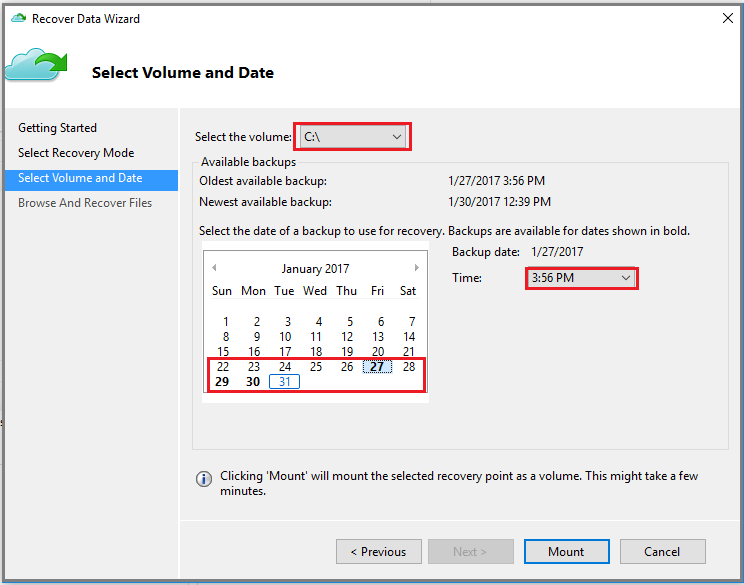 以粗体显示的日期指示至少有一个可用的恢复点。Dates in bold indicate the availability of at least one recovery point. 如果单个日期有多个可用的恢复点，请从“时间”下拉菜单中选择特定的恢复点。If multiple recovery points are available within a single date, choose the specific recovery point from the Time drop-down menu. 选择要还原的恢复点之后，选择“装载”。After choosing the recovery point to restore, select Mount. 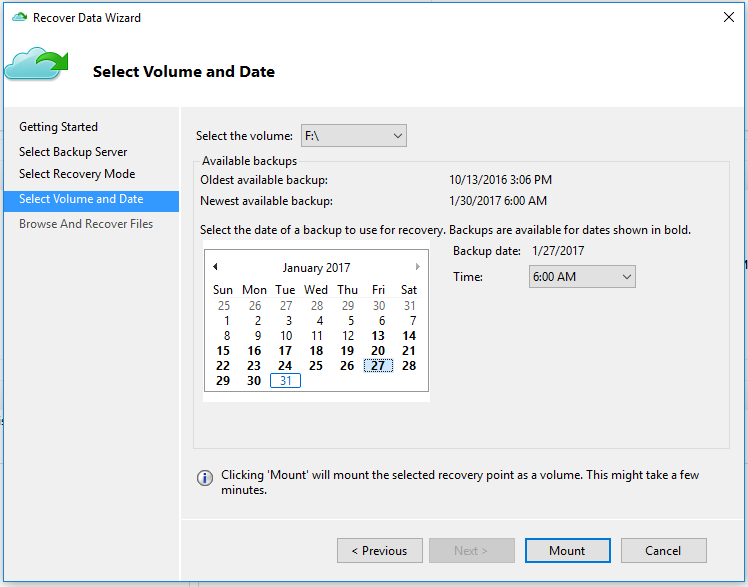 Azure 备份会装载本地恢复点，并将其用作恢复卷。Azure Backup mounts the local recovery point, and uses it as a recovery volume. 在“浏览和恢复文件”页上，选择“浏览”打开 Windows 资源管理器并找到所需的文件和文件夹。On the Browse and Recover Files page, select Browse to open Windows Explorer and find the files and folders you want. 在 Windows 资源管理器中，复制想要还原的文件和文件夹，将其粘贴到服务器或计算机本地的任何位置。In Windows Explorer, copy the files and folders you want to restore, and paste them to any location local to the server or computer. 可从恢复卷直接打开或流式传输文件，并验证是否恢复的是正确的版本。You can open or stream the files directly from the recovery volume, and verify that you are recovering the correct versions. 完成后，在“浏览和恢复文件”页上，选择“卸载”。When you are finished, on the Browse and Recover Files page, select Unmount. 然后选择“是”，确认要卸载该卷。Then select Yes to confirm that you want to unmount the volume. 如果不选择“卸载”，恢复卷将保持装载 6 个小时（从装载时算起）。If you do not select Unmount, the recovery volume will remain mounted for 6 hours from the time when it was mounted. 但是，如果正在持续进行文件复制，装载时间延长至最多 24 小时。However, the mount time is extended up to a maximum of 24 hours in case of an ongoing file-copy. 装载卷时，不会运行任何备份操作。No backup operations will run while the volume is mounted. 计划为在装载卷时运行的任何备份操作会在卸载恢复卷后运行。Any backup operation scheduled to run during the time when the volume is mounted will run after the recovery volume is unmounted. 如果整个服务器断开连接，仍可以将 Azure 备份中的数据恢复到另一台计算机。If your entire server is lost, you can still recover data from Azure Backup to a different machine. 下面的步骤演示了工作流。The following steps illustrate the workflow. 源计算机 – 从中创建备份并且当前不可用的原始计算机。Source machine – The original machine from which the backup was taken, and which is currently unavailable. 目标计算机 – 要将数据恢复到的计算机。Target machine – The machine to which the data is being recovered. 示例保管库 – 源计算机和目标计算机注册到的恢复服务保管库。Sample vault – The Recovery Services vault to which the source machine and target machine are registered. 无法将备份还原到运行较低 操作系统版本的目标计算机。Backups can't be restored to a target machine that is running an earlier version of the operating system. 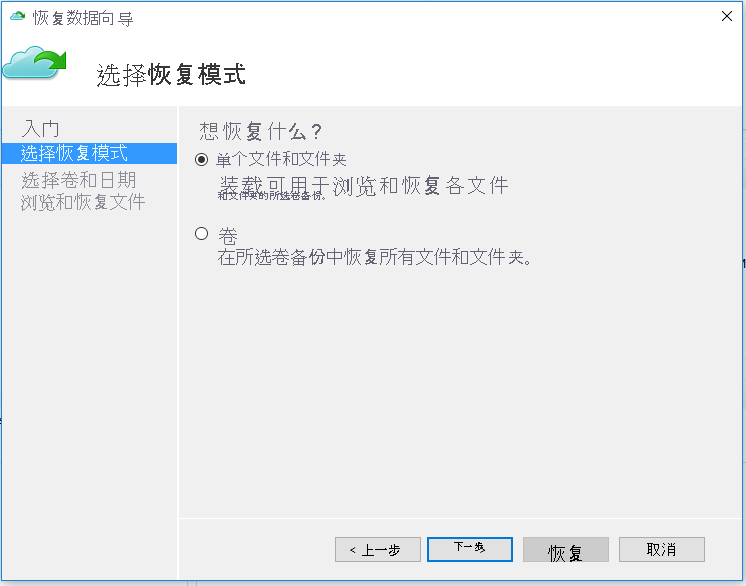 例如，在 Windows 8（或更高版本）的计算机上，可以还原在 Windows 7 计算机中创建的备份。For example, a backup taken from a Windows 7 computer can be restored on a Windows 8 (or later) computer. 但是，在 Windows 8 计算机上创建的备份无法还原到 Windows 7 计算机。A backup taken from a Windows 8 computer can't be restored to a Windows 7 computer. 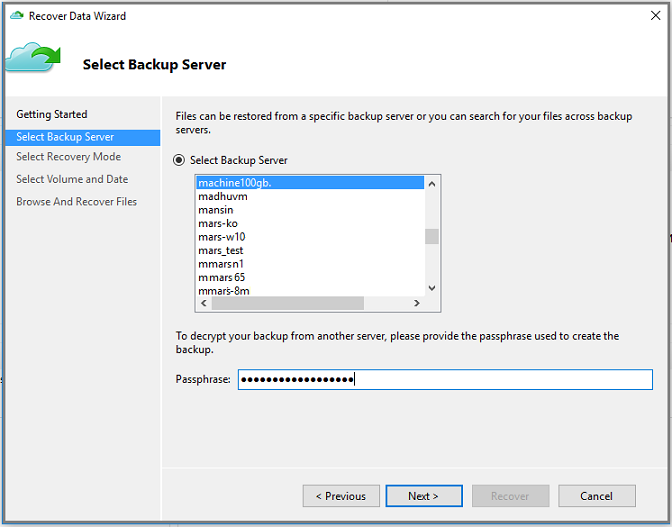 在目标计算机中打开“Microsoft Azure 备份”管理单元。Open the Microsoft Azure Backup snap-in on the target machine. 确保目标计算机和源计算机已还原到同一个恢复服务保管库。Ensure that the target machine and the source machine are registered to the same Recovery Services vault. 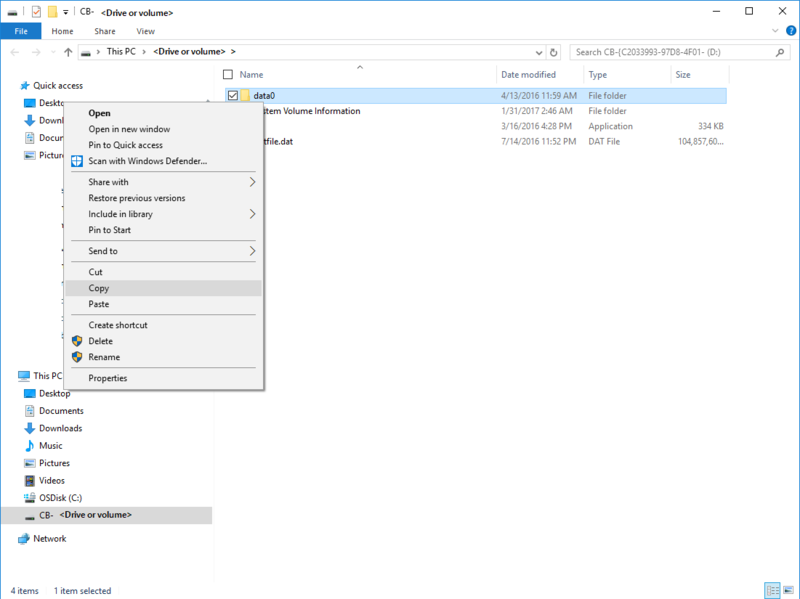 选择“恢复数据”打开“恢复数据向导”。Select Recover Data to open the Recover Data Wizard. 在“开始”页上选择“另一台服务器”。On the Getting Started page, select Another server. 提供对应于示例保管库的保管库凭据文件，并选择“下一步”。Provide the vault credential file that corresponds to the sample vault, and select Next. 如果保管库凭据文件无效（或已过期），请在 Azure 门户中从示例保管库下载新的保管库凭据文件。If the vault credential file is invalid (or expired), download a new vault credential file from the sample vault in the Azure portal. 提供有效的保管库凭据后，会显示相应备份保管库的名称。After you provide a valid vault credential, the name of the corresponding backup vault appears. 在“选择备份服务器”窗格中，从显示的计算机列表中选择源计算机并提供通行短语。On the Select Backup Server page, select the source machine from the list of displayed machines, and provide the passphrase. 然后，选择“下一步”。Then select Next. 在“选择恢复模式”页上，选择“单个文件和文件夹” > “下一步”。On the Select Recovery Mode page, select Individual files and folders > Next. 选择“装载”，在本地将恢复点装载为目标计算机上的恢复卷。Select Mount to locally mount the recovery point as a recovery volume on your target machine. 在 Windows 资源管理器中，从恢复卷复制文件和文件夹，并将其粘贴到目标计算机位置。In Windows Explorer, copy the files and folders from the recovery volume, and paste them to your target machine location. 可以从恢复卷直接打开或流式传输文件，并验证是否恢复了正确的版本。You can open or stream the files directly from the recovery volume, and verify that the correct versions are recovered. 恢复文件和文件夹后，可以管理备份。Now that you've recovered your files and folders, you can manage your backups.